Your religious beliefs are very important. They are also very individual and personal. I simply want you to understand that medications and your beliefs can live in harmony. Part 3 of 16 on bipolar medicines. Many people, no matter what their illness or disorder is, decide to stop taking medications because the side effects of those medications beome too much to bear. However, this is a very bad idea. Unfortunately, everyone who is faced with having to take daily medications will eventually feel the burden of the cost of those medications. Luckily, options are available to ease that burden. "My medications just aren't working", is a common complaint voiced by many people who are dealing with Bipolar Disorder. And there are two main reasons why you may be feeling this same way. There are several types of therapy for bipolar disorder: Psychotherapy (Talk Therapy), Cognitive Behavioral Therapy (CBT), Family Focused Therapy (FFT), and a special type of therapy called Interpersonal and Social Rhythm Therapy (IPSRT). You should know that you need to take medication in order to treat your bipolar disorder. But the real key to success is in finding the right "Triangle of Professionals." You can't live in even the most beautiful of homes without having a good, strong foundation first. Well, it's the same with bipolar disorder. In order to have success (i.e., stability) with the disorder, you need to have a strong foundation as well. The excuses not to take bipolar medication may be as varied as the people who are prescribed the medication. 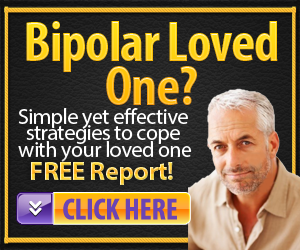 However, if you are a supporter of a loved one with bipolar disorder (or work with people who have it) and you become familiar with the most common excuses, you can know better how to combat them. Being a supporter of a loved one with bipolar disorder, I'm sure you're concerned about their well-being, especially when they go into episodes. The best way to prevent their episodes is through the use of bipolar medications. Without them, your loved one is in danger – they may even experience suicidal thoughts. Have you ever tried to get your loved one the treatment that you know they need, but felt like a second-class citizen because nobody would listen to you? Have you had to watch helplessly as your loved one got more and more out-of-control because you couldn't get them the help that they needed?